The big question? Do I need uplighting for my event? You’re busy planning your event to perfection and there are a few things we either forget about, don’t think about or don’t even know about, which really makes a difference to any corporate, wedding or private event. For years the big question has always been, do I need uplighting for my event? You put a lot of time, effort and money into making things perfect for your guests to really give them the wow factor and sometimes cut backs in budgeting leave this question lurking, do I need uplighting for my event? The answer in short is… Absolutely you do! Let me explain why! We have all been to an event where you have paused for a moment and thought, this looks simply amazing, luxurious and just breath taking. I can almost for certain guarantee there was some element of lighting giving the location a touch of something special. Here at Algarve DJ Hire, we offer a full range of uplighting from 9watts right up to architectural 80watt battery powered and wireless lighting solutions for any and every lighting application. We offer a completely bespoke event styling consultation to go through ideas, colours and even down to where each light can be placed for maximum effect. Buying and owning lighting isn’t enough, you need to have the vision and experience of knowing what will work. Here at Algarve DJ Hire with over 20 years experience in events, we are ready to share our knowledge to help create something beautiful. What a great location and setting Purobeach has to offer right on Falesia Praia, next to the crashing waves and sea water. What more could you ask for to host your event? We were booked to provide sound and lighting for the wedding of Mr & Mrs Scully at Purobeach. We spoke about the potential for uplighting and giving the place a real sense of atmosphere. So, we were also booked for uplighting the venue too. 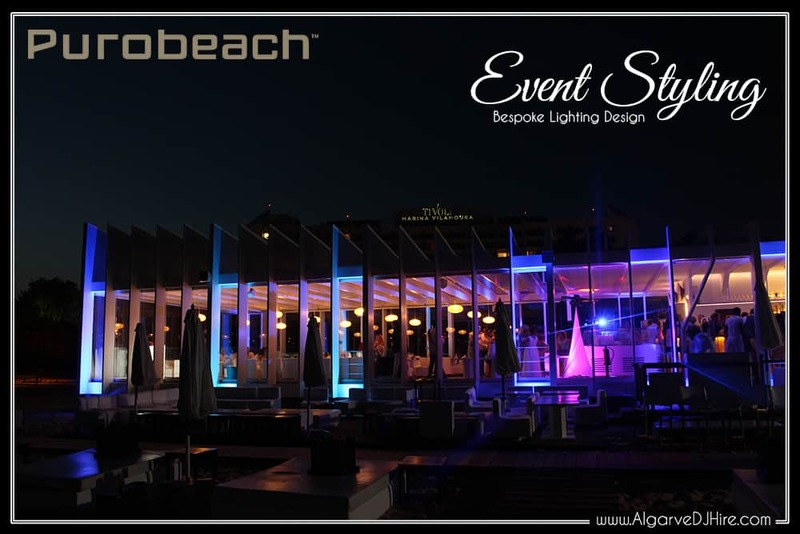 The pictures above show our uplighting on the exterior white sleek design of Purobeach which from the inside looked absolutely stunning and gave the effect of having 3 metre light bars on the glass work and illuminating the entire frame. The staff at Purobeach absolutely loved the look of the venue and were even dancing with the guests too. 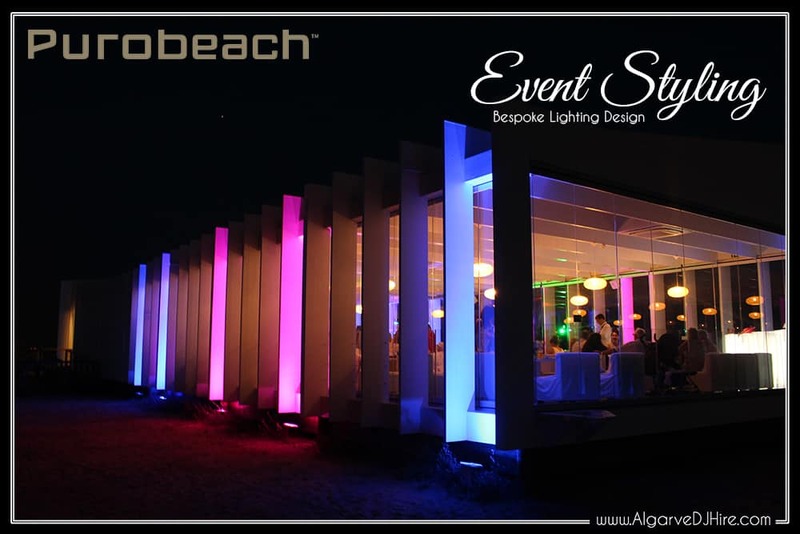 A great sound, lighting and uplighting success with everyone celebrating in one of the most stunning venues on the Algarve Coast. 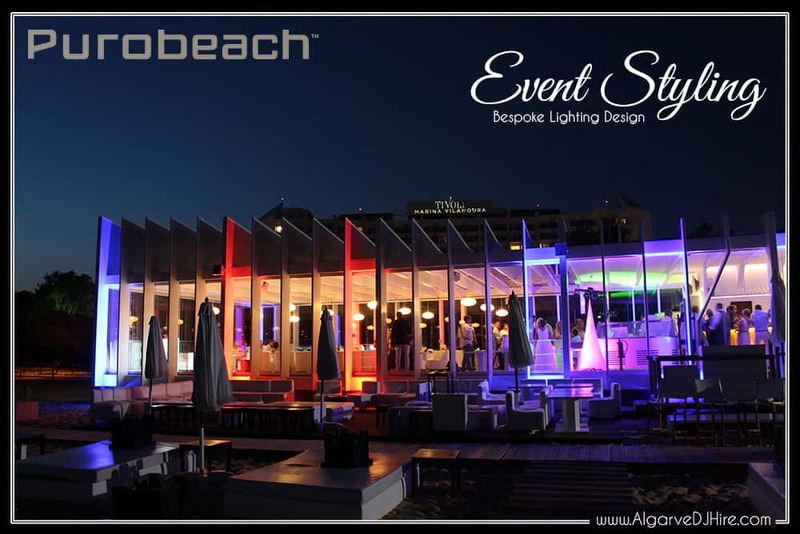 If you’re looking for a venue here in the Algarve to hold your Wedding, birthday, private or corporate function then get in touch with Purobeach, as the team are great and the venue they have to offer are perfect for any occasion! 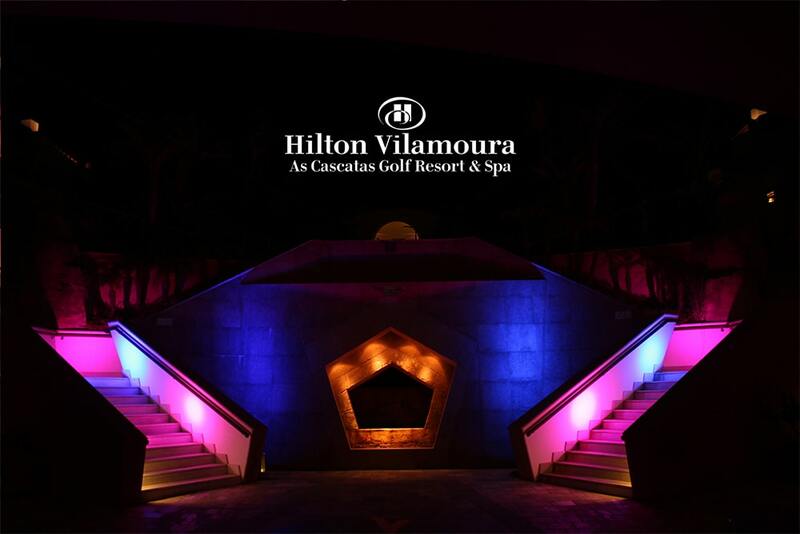 Hilton Vilamoura As Cascatas Golf Resort & Spa! 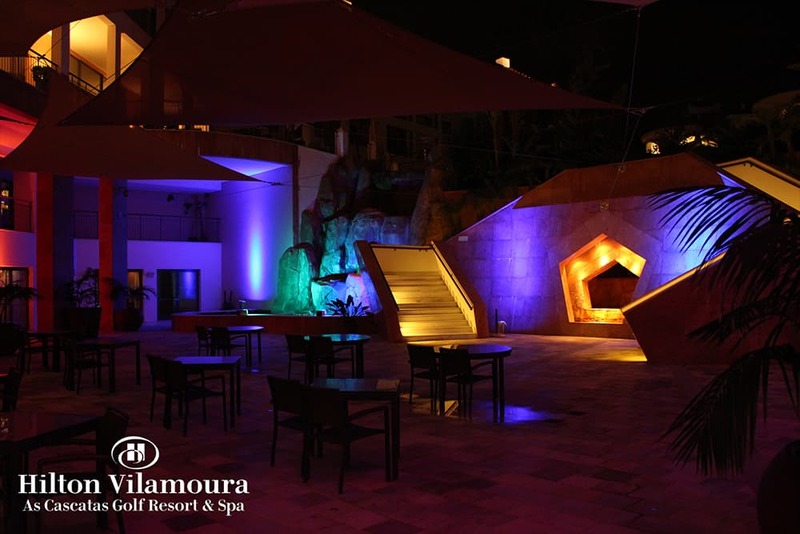 This uplighting at the Hilton Vilamoura really shows off what can be done with lighting to bring an area to life. Are you still asking yourself, do I need uplighting for my event? You should be thinking, how will I uplight my event and what colour? 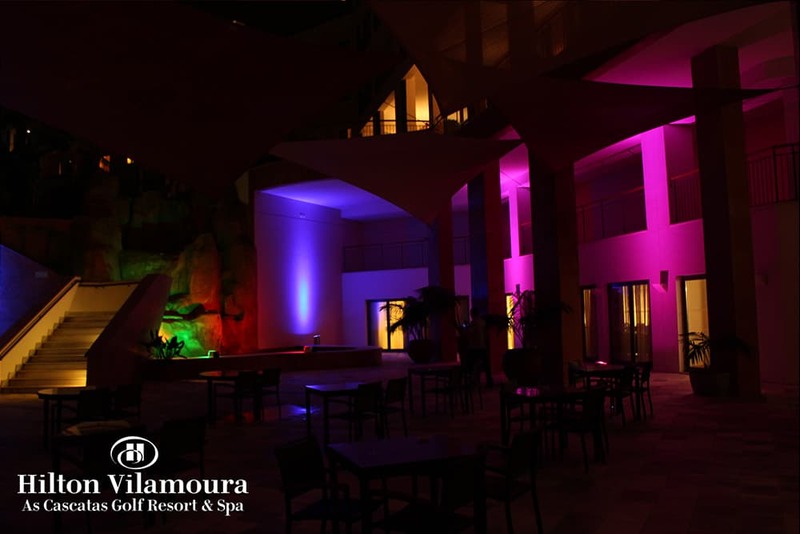 We love lighting and the Blue Lagoon at the Hilton Vilamoura is an absolutely great location and setting for your wedding, birthday or corporate events as there are many versatile uses for uplighting this area. Want your event to look luxurious and memorable? Then get in touch with us today! Lighting your event could not be easier, why not have a chat with one of our lighting technicians today about your ideas and thoughts so we can make them a reality.